If you have an epic tale to tell, do it in a custom family history book. Do a little research (you don’t have to be a historian—just be curious) and share your family’s story. Lucky enough to have a large family? See how you can make a family yearbook (just like a school’s yearbook) to get everyone into the picture. Time flies, babies become toddlers, and before you know it they’re out of the nest. Simple photo books documenting their growth likewise become treasured reminders—use pre-designed templates or create your own layouts. Watch our series of short, handy Book Camp videos and see how to put your book together, from organizing your photos to hitting Order. You can even check out our step-by-simple-step tutorial about how to make a family photo book. A big chunk of the button crafts I’ve found are jewelry so I thought this idea would be a nice change of pace. Plus it is super simple. All you need is buttons, paper clips, hot glue and some scraps of felt. Click on the photo above for I Heart Nap Time’s tutorial. 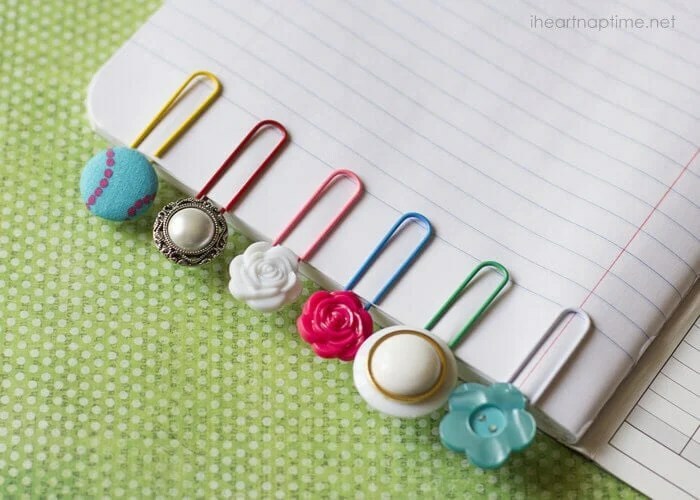 If you have buttons from someone who loved to read these bookmarks would make the perfect opportunity to share a story about that person’s favorite book. I might just make a few of these for the kids I tutor in reading at the local elementary school. I think they would love them. This button bracelet would be so much fun to do at a family gathering. Have the supplies gathered and enjoy some storytellling, chating and bonding while everyone creates a one of a kind bracelet with ties to their family through the buttons and memories of making them together. Click on the photo for Hope Studios’ step by step tutorial.